Talgarth is an exhilarating place to fly. Whether you’re a group, and experience pilot or an individual learning to glide, you will take many fond memories home. The club welcomes visitors, and has a reputation for being friendly and inclusive. The club has a policy of encouraging visiting pilots, particularly post solo and developing pilots, but for safety and efficiency we need to know the demands your group will make on us. We would like you to enjoy your visit so, to help us help you, please read these notes, consider the points raised and provide the information requested. If you’re an individual pilot or two then it is important to get in touch. Who knows, we may not be operational, or we may have a large group booked in. Contact the office by phone, using our contact form [link] or emailing us. • If you are a group of more than a couple of pilots get in touch with us using our general contact form or via expeditions@blackmountainsgliding.co.uk with your initial request. This will be forwarded to our Expedition and Visitor coordinator. • Identify suitable dates with the Expeditions Co-ordinator – generally week long expeditions cover the first Saturday through until end of flying on the following Friday. This is to avoid any overlap of expeditions. • Pre-booking – this means completing a booking form, and returning it to the Expedition Co-ordinator. • A £20 deposit per pilot is required. This is refundable against flying, membership, trailerage, camping and other BMGC fees – and confirms the requested booking. • Cancelling – with 21 days or more notice – a full refund. • Cancellation with less than 21 days notice/fail to arrive – no refund. The booking form will give you the opportunity to describe any special objectives or requirements you may have. We recommend you bring a copy of your current medical certificate and/or your EASA gliding licence. 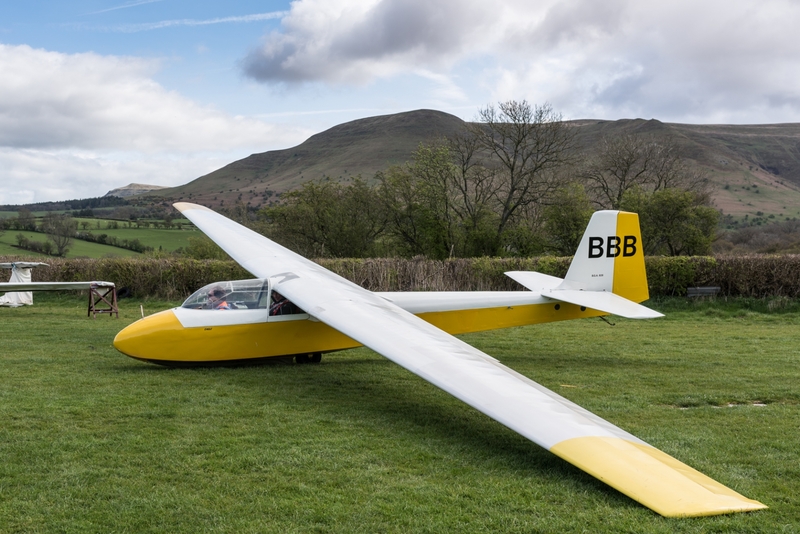 Visiting pilots who wish to fly P1 in a BMGC glider will need to provide a copy of their medical certificate/licence before being permitted to fly solo in BMGC gliders. How much instructor support is required for your group? Most pilots find a good briefing and site check adequate for their needs. Some wind conditions (more commonly found in autumn and winter) can demand further training, particularly if pilots are inexperienced. Local soaring is possible in all wind directions except for east through to south. For the more adventurous, certain ridge runs are only permitted (solo) for cross country pilots, early pilots need to take an instructor. Visiting instructors may only instruct at Talgarth after clearance from the CFI. Approved instructors are most welcome to conduct their own two seat training, if they wish. How much will your group rely on the club two seater fleet. Pilots are encouraged to bring their own aircraft. A radio transceiver (130.1) is a highly desirable safety item. Pilots are advised to have evidence of both insurance and Cof A. How much space will you need? We must know in advance how many tents / caravans are coming. Space is at a premium in the busy period and unexpected campers may be redirected to local campsites. By prior arrangement, evening lectures can be given by the resident instructor. This is an ideal opportunity for a group BBQ! Sometimes wet weather lectures can be laid on at short notice. The subjects can include Use of Radio, Altimetry, Hill Soaring, Field Landing, Bronze C subjects, Map Reading, Airspace and so on. Let us know if your group has an interest. Specialist Training: The chance to do something different! We may be able to offer training in the following areas during your visit – Instrument/cloud flying, aerobatics, field landing (for real). Let us know in good time, so arrangements can be made.